Working in cooperation with the United Nations Development Program (UNDP), The AGBU-United Nations Special Interest Group hosted its first benefit reception on July 24, 2008 at the UN headquarters in New York. The reception raised funds for the UNDP Youth Career Trail Project, which seeks to mitigate youth unemployment in Armenia by partnering recent college graduates with leading host organizations through a six-month paid internship program. More than one hundred guests, including AGBU and UN dignitaries, attended the reception. The benefit reception included remarks by His Excellency Armen Martirosyan, Ambassador Extraordinary and Plenipotentiary, Permanent Representative of Armenia to the United Nations, Arda Haratunian, Member of AGBU Central Board of Directors, and Consuelo Vidal, UNDP Resident Representative to Armenia, as well as a video presentation featuring interviews with recent Youth Career Trail project interns. Hors d’oeuvres and live jazz music also accompanied the evening. Although uninterrupted economic growth has been documented in Armenia since 1994, economic recovery has not resulted in a real expansion for employment so unemployment is one of Armenia’s key social and economic problems. Young people are especially affected by this trend, with youth unemployment in Armenia reaching a critical level of almost 50%. Within the framework of the UN Global Compact initiative, the Youth Career Trail Project is a joint effort between UNDP, the private sector, and non-governmental organizations, such as AGBU, to alleviate youth unemployment rates in Armenia. Easing the transition from college to the workforce, participants in Yerevan and the outer regions earn valuable on-the-job experience relevant to their education. Participants in the Youth Career Trail Project also refine necessary career skills through the program’s capacity-building seminars. In addition to partaking in a six-month paid internship, participants attend seminars which offer help in presentation skills and interviewing, as well as guidance in writing an effective résumé. Host companies are encouraged to hire successful candidates upon completion of the internship period, and over 50% of the first Youth Career Trail class has found long-term employment. The AGBU-UN Special Interest Group is proud to help sponsor the third class of interns. Kim Yacoubian, AGBU’s Main Representative to the UN, stated, “After nearly a year, our work has culminated in this evening, the first of many initiatives to come, bringing us together to support the next group of interns this coming August.” AGBU-UN SIG’s benefit reception raised $6,000, which will cover the internship stipends of ten upcoming Youth Career Trail Project participants. To make a donation or for general inquiries, please visit www.agbu.org/un. the funds provided. The total cost of the renovations came to $60,000. 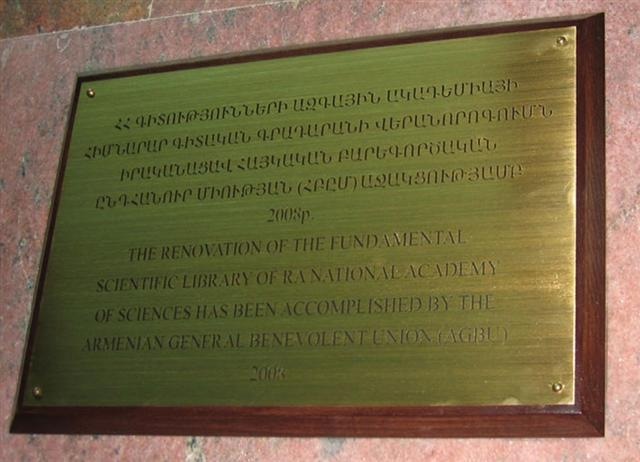 publications and enjoys a leading role in the Armenian library network. library, which is administered by director Dikran Zarkarian. assistance provided by AGBU toward their studies in the performing arts. The performing artists include seven pianists: Hayk Arsenyan (NY), Dr.
Martikyan (NY) and Vardan Ovsepian (Boston). Office, at CarnegieCharge at 212-247-7800 or at www.carnegiehall.org. performing arts and have demonstrated excellence in their chosen fields. and readiness to participate in our difficult task of reconstruction. 2008, in the Greek school’s Louis and Hrant Fenerjian Auditorium. The XVIII AGBU World Games took place in Montevideo, Uruguay, from July 7 to 13, 2008, with athletes and guests pouring in from Antwerp, Buenos Aires, Cordoba, Detroit, Los Angeles, Miami, New York, Pasadena, Sao Paolo and Toronto. Organized by the local Chapter, the weeklong event included numerous sporting competitions, cultural performances, social outings and a sold-out Gala evening on Saturday, July 13, attended by AGBU President Berge Setrakian. 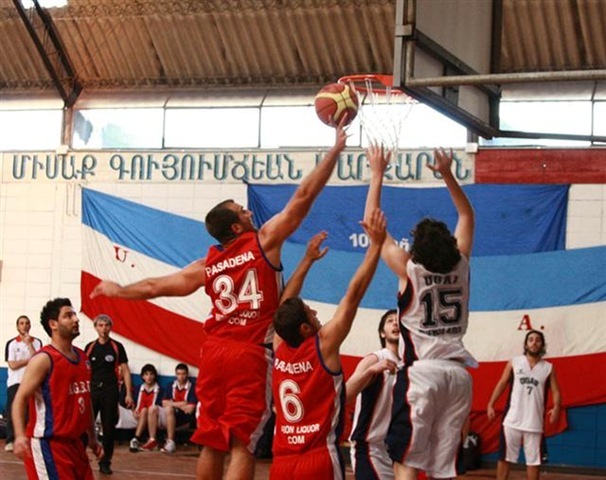 In all, approximately 1,000 individuals participated in this biennial event aimed at providing a platform for the organization’s athletic groups to engage in friendly competitions and bringing together Armenian youth on a global level. Monday, July 7, marked the official start of the Games with the Opening Ceremonies at the AGBU complex on Agraciada Avenue in the Uruguayan capital, located just blocks away from the Presidential Palace. Approximately 800 athletes and supporters jammed the bleachers in the gymnasium and cheered loudly as each delegation marched in with its national flag. Highlights of the evening included welcoming remarks by His Excellency Vladimir Garmirshalian, Ambassador Plenipotentiary of Armenia to Argentina, Brazil, Chile and Uruguay; AGBU Central Board Member Ruben Kechichian of Buenos Aires; and AGBU Montevideo Chapter Chair Hagop Chamikian, who recognized World Games benefactor Albert Boyajian with a plaque. US Ambassador to Uruguay, His Excellency Frank Baxter, was also present with his wife. A multimedia cultural presentation tying together the histories of Armenians, AGBU and the Montevideo Chapter was designed exclusively for the event, and included video projections, modern and tango dances and a unique interpretation of the AGBU anthem. Going for the Gold: Bring It On! Whether it was the Los Angeles and Pasadena teams cheering on their North American counterparts from Toronto or the marching band drums and shouts from the far corner of the gym in favor of Buenos Aires, there was a fun, competitive spirit in the air all week throughout the AGBU complex in Montevideo. At least 400 athletes participated in basketball (men’s and women’s), volleyball (men’s and women’s), and soccer (men’s) team sports; and swimming, table tennis, chess and backgammon individual tournaments. Players dribbled, bounced, kicked, and ran to vie for their chance at AGBU gold. In the end, even the non-victorious teams were treated like winners as everyone became friends in the stands. The World Games Committee planned a number of events for athletes and guests almost every night to provide cultural and social entertainment. On average, each event attracted around 350 guests. 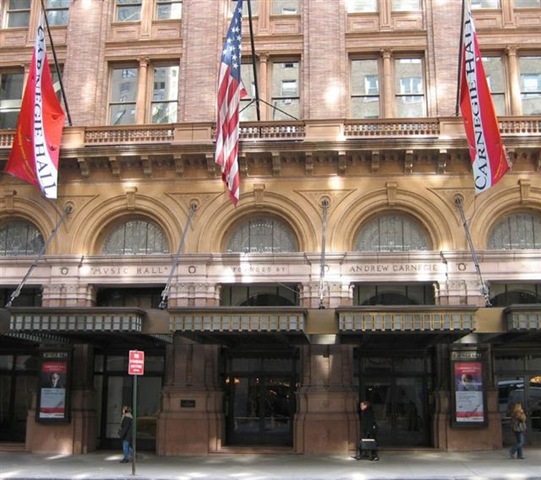 On Tuesday, July 8, a special concert was held at the Radisson Hotel featuring the Montevideo Philharmonic Orchestra. Heightening the ambience of the performance was the fact that the conductor, Alvaro Hagopian, is not only Armenian, but a graduate of the local AGBU Nubarian and Manoogian schools. Maestro Hagopian conducted a repertoire of tango pieces for the first half with a tango couple bringing the music to life on stage, and selections from Aram Khachaturian’s “Gayane Ballet” for the second portion. The night of Friday, July 11, culture enthusiasts gathered for a spectacle featuring the AGBU Montevideo Choir “Grung,” the AGBU Cordoba Dance Group “Ararat” and the Armenian National Center of Uruguay’s “Gayane” Dance Group. Maestro Alvaro Hagopian led the 35 vocalists in “Grung” through a number of popular Armenian songs. The “Ararat” Dance Group, which was established over 20 years ago by Elizabeth Gezokaraian Erezian, performed her choreography to the music of Ara Gevorgian and also executed the famous pyramid dance. Fittingly, the “Gayane” group danced to selections from the “Gayane Ballet.” The event was held at the prestigious Ancel Hall. In addition, two social events were held on Wednesday, July 9. The first was a dinner and show at El Milongón to introduce guests to the local culture. The venue featured live music and dances from both tango and traditional Candombe genres, the latter having dominated Uruguay’s culture for 200 years. For late-night revelers, a club night kicked off at Central at midnight and kept going until dawn with a vibrant mix of Armenian and progressive music keeping dancers on their feet. The five-star Radisson Hotel, situated on Montevideo’s historic Plaza Independencia, hosted a sold-out crowd of 540 guests on Saturday night, July 12, for the closing Gala banquet. Winning teams brought their championship cups to display on their tables, and everyone was in a celebratory mood to toast the successful close of yet another World Games. AGBU President Berge Setrakian was present to witness the festivities alongside Central Board Member and Buenos Aires Chapter Chairman Ruben Kechichian; Montevideo Chapter Chairman Hagop Chamikian; and Chairmen from sister Chapters: Ricardo Erezian (Cordoba), Zaroohi Der Mugrdechian (Fresno), and Krikor Manukian (Sao Paolo). The program began with MC’s Cynthia Cristina Takessian and Socrates Yamgochian welcoming everyone, and continued with World Games Montevideo Committee Chairman Ruben Topalian who spoke about the meaning and thrill of having hosted the AGBU games. Chamikian also addressed the audience and then presented gifts of appreciation to lifelong AGBU members Hrant Bardakjian of Toronto and Hratch Manoukian of Nicosia, both of whom have been driving forces in AGBU athletics. Special recognition was bestowed upon Topalian for his able chairmanship of the Games, and Valeria Momdjian, Executive Secretary of the 2008 World Games Committee, who served as a key player in the organization of the endeavor. Closing remarks were offered by President Setrakian, who stated that the evening did not signify the end of the Games, but rather the start of many new friendships spanning the globe. The Gala lasted until the early morning with a diverse array of entertainment provided by the Yerevan 50 and Dzirani bands. The Yerevan 50 Band was initiated in 1971 by members of the AGBU Montevideo Scouts group of the same name. Today, this musical ensemble has achieved major recognition among all the Armenian communities of South America. The second band, Dzirani, was formed by young members of the AGBU Cordoba Chapter just a few short years ago. Both groups kept the dance floor full the entire night with their renditions of popular and traditional Armenian music, and applause filled the entire room continuously during a presentation of photos taken during the entire week. While the main trophy presentation ceremony took place in the complex’s gymnasium on Saturday afternoon, three special cups that define the true meaning of the AGBU World Games were presented at the Gala. The first one was for Friendship, which was awarded to the Los Angeles/Valley delegation and accepted by its leader, Jano Baghdanian. The second cup, won by the Toronto delegation, was for Fair Play, and the final cup, given for having the Best Armenian Spirit, brought the Cordoba delegation to the stage. On the competition side, the home team of Montevideo took the gold in Men’s Basketball, and the Pasadena team won the championship in Women’s Basketball. To see the full results from all games, please visit: www.ugab.org.uy/worldgames.